Tardigrades (Latin: Tardigrada) also known as water bears are microscopic animals (their body size varies from 0.05 to 1.2 mm). In the contemporary taxonomy they are considered as one of the invertebrate Phyla (that means they are not insects, mites or crustaceans, they are just tardigrades). There are over a 1000 described species so far, however it is estimated that the total number of tardigrade species may exceed ten times as many (click here to view the most recent list of all known tardigrade species). The evolutionary history of tardigrades is mostly a mystery. Given that their bodies are tiny and soft, they don't fossilise easily and finding any fossils that somehow survived to our days is like winning a lottery! However, both molecular and traditional taxonomy suggests that they are most related either to Arthropods or Nematodes. Anyway, what is sure is that they are an old group of animals (the oldest known fossils come from mid Cambrian, ca. half a billion years ago! ), and that they belong to the mega-clade Ecdysozoa (moulting animals). All tardigrades have four pairs of legs and a complicated feeding (buccal) apparatus. They come in the variety of colours (transparent, white, red, orange, yellow, green, purple, black). Water bears also show a variety of reproductive strategies (including parthenogenesis and hermaphroditism). Some species lay richly ornamented eggs (click here for some photos of terrestrial tardigrades and their eggs). "Tardigrades on moss" - plate from the book "Tardigrada" by Ernst Marcus, 1929 (click the miniature to view the full size scan). One of the main reasons for which water bears are considered weird, is their ability to survive in extreme conditions. When they are in the active stage (i.e. when they crawl around, eat and reproduce) they are no tougher than any other animal. However, when conditions worsen water bears can dry or freeze - this peculiar form of existence is called cryptobiosis (or anabiosis). When cryptobiotic, tardigrades look like they are dead - they don't eat, don't move, and don't breath - in other words their metabolism is undetectable. In this anabiotic stage they can be exposed to very high X-ray radiation of 570 000 rads (500 would kill a human! ), very high pressure or vacuum, finally they can withstand temperatures as high as over plus 150°C and as low as minus 272.8°C (almost absolute zero)! Tardigrades are so tough that when they have been sent to the outer space and then brought back to Earth and hydrated, they exhibited rates of survival close to the individuals that have never left the laboratory! 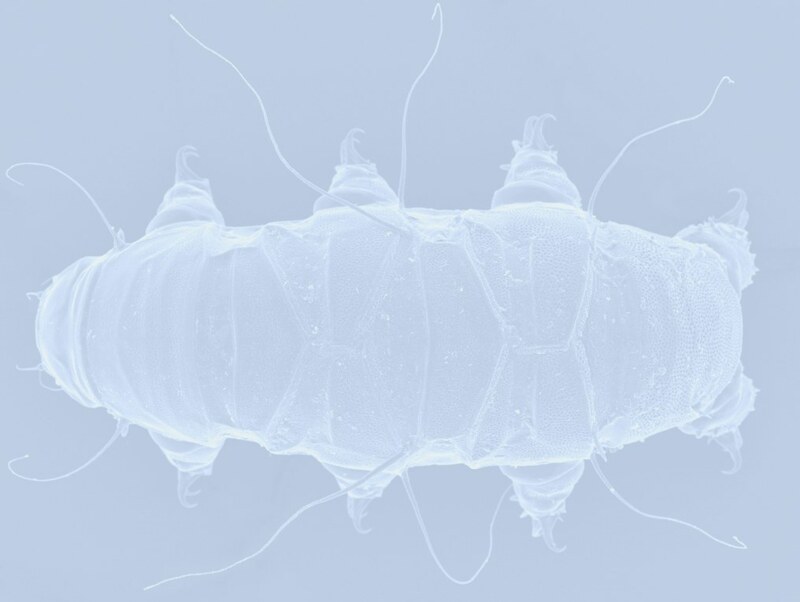 Thanks to these record-breaking properties, Tardigrades can inhabit a huge variety of environments - from the ocean floors (7 km below sea level) up to the high mountain tops (even higher than 6 km above sea level). Although all tardigrades in the active stage need water, beside the marine and freshwater environments, they can be found in terrestrial habitats too. The only requirement is that these habitats have liquid water at least seasonally (such as moss cushions, lichens, soil, even ice surface). As you may already suspect, Tardigrades live on all continents. Because when tardigrades are in the cryptobiotic stage, they are "dead but still alive", they can - as Dr. Robert Schill said at the X International Symposium on Tardigrada - "teach us something very important about the nature of life". Nelson, D.R. 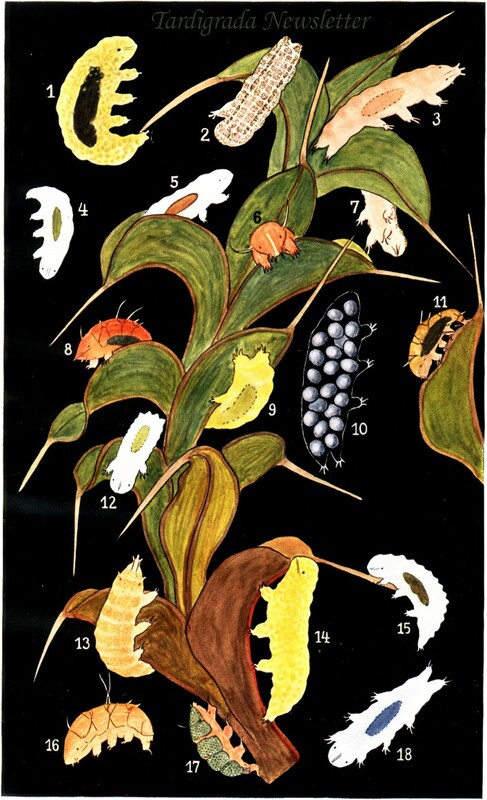 & Marley, N.J. (2000) The biology and ecology of lotic Tardigrada. Freshwater Biology, 44(1): 93-108.